May 29, 2016 By This post may contain affiliate links. Swirl colorful chocolates together to create beautiful handmade Chocolate Sea Shells. 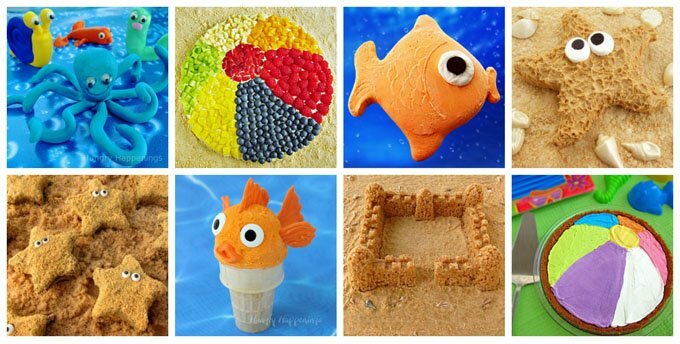 They will add a wonderful realistic look to your beach themed cakes, cupcakes, and treats. 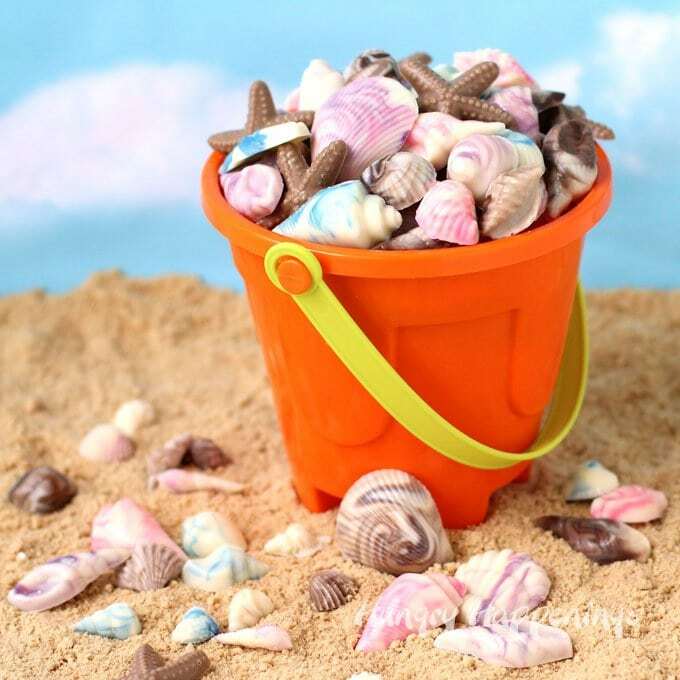 If you are hosting a beach themed party, you can really impress your party guests by serving some of these chocolate sea shells. Depending on the molds you use to create your shells, they can look so realistic that your guest will think you picked them up off the beach. 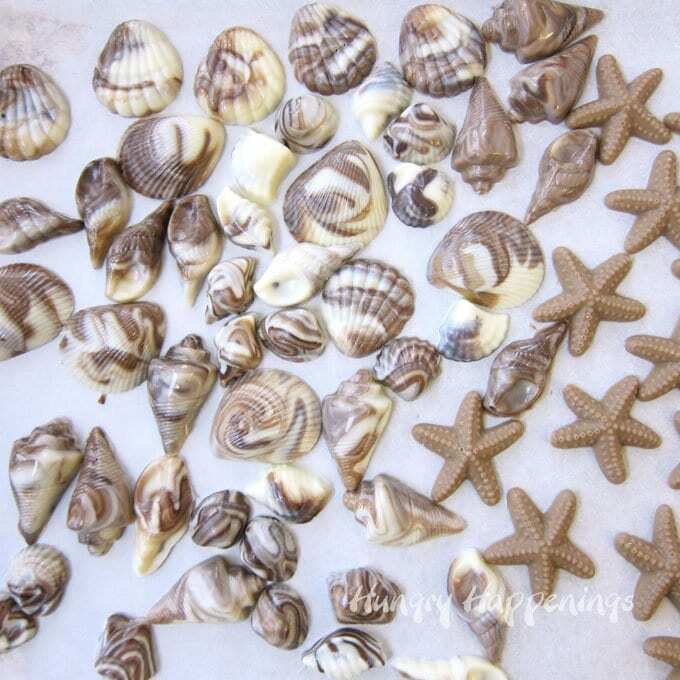 I created a lot of these swirled shells to serve at my nephew’s beach themed graduation party and used them to decorate mousse cups and Mini Chocolate Beach Pails. The party guests were in awe. I really loved watching as the party guests interacted with all the treats on my dessert table, but was especially thrilled to see how everyone reacted to the chocolate sea shells. So many guests wanted to know how they were made and I was happy to tell them I would share my tips and tricks here on the blog. They really are quite easy to make. 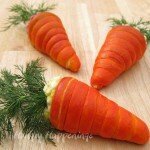 If you’d like to make some of these colorful candy shells you’ll need both white chocolate and another colored chocolate. 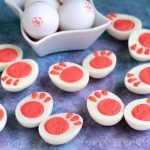 I chose to use the Candy Melts because I only had a few sea shell candy molds to work with. I knew I would need to have a way to keep my colored chocolate melted all afternoon while I made hundreds of shells. By using the confectionery coating, I could melt small bowls of it, and keep them warm for hours by setting them in a water bath in an electric skillet. You can learn all about working with Candy Melts and keeping them warm in a skillet on my Chocolate Making Tips page. You can use either a disposable pastry bag or a squeeze bottle to make the shells. In this example, I used the bag. Brush a thin stripe of colored chocolate down one or two sides of your pastry bag. Then fill it with white chocolate. Cut the tip off the bag, cutting a small opening. Pipe the chocolate into candy molds. As you pipe, the colors will swirl together. Pop the mold in the freezer (if using pure chocolate, place them in the refrigerator) until the candy hardens, then remove and un-mold. 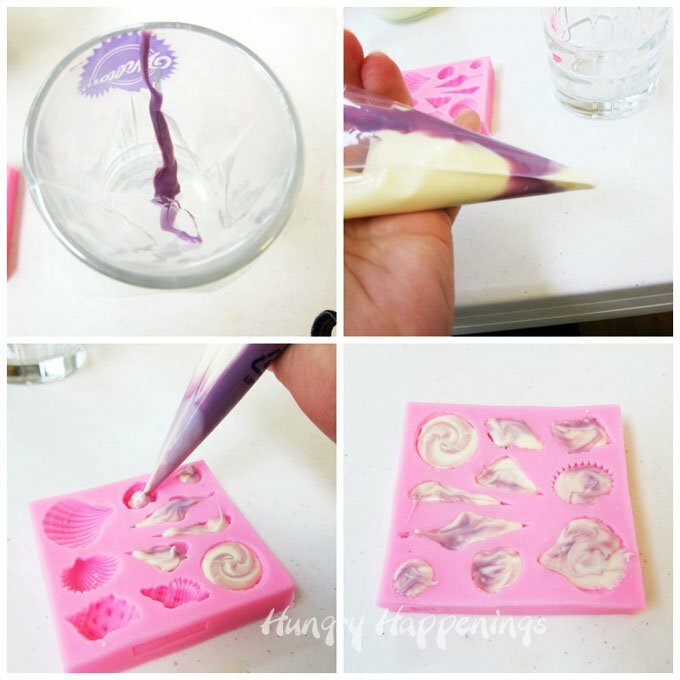 If using this silicone sea shell fondant mold to make the tiny shells, they will take less than 5 minutes to harden. 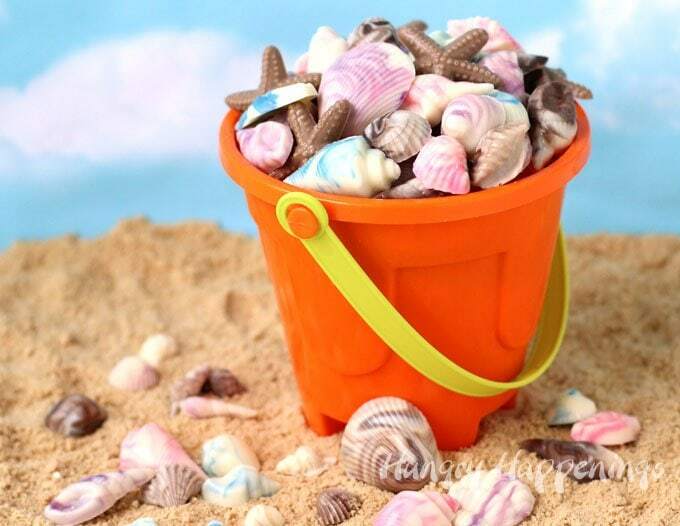 These shells are the perfect size to put into Mini Chocolate Beach Pails. The largest of these shells is about the size of a penny. They are small! 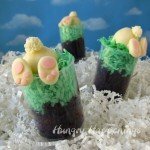 If you have filled all your candy molds and still have some chocolate in your pastry bag, fold over the tip, so the chocolate doesn’t spill out, and snuggle it into an empty glass that is set in the warm water in your skillet. 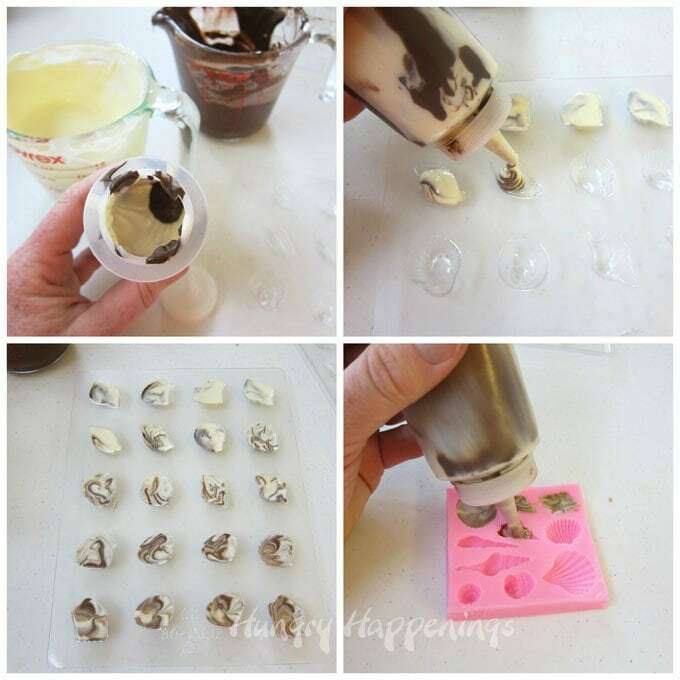 This will keep the chocolate warm, so that when your chocolates come out of the freezer and are un-molded, you can simply pull the pastry bag out of the glass, and pipe some more shells. 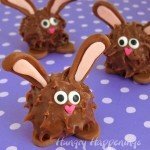 If the chocolate does harden, pop then entire bag in the microwave and heat on 50% power for 10-20 seconds. If you prefer, you can create the same swirled effect using a squeeze bottle. Just note that it’s a bit trickier to get a nice line of chocolate brushed down the size of the bottle. Be sure to allow your candy molds to come to room temperature before filling them so that the chocolate flows easily and fills the mold fully. You can set the squeeze bottle in the warm water in the skillet or reheat it in the microwave if the chocolate becomes too thick to pipe. Don’t you just love all the unique patterns in each of these chocolate shells? If you have a candy mold with some starfish, be sure to make some of those as well. Colorful swirled chocolate sea shells. 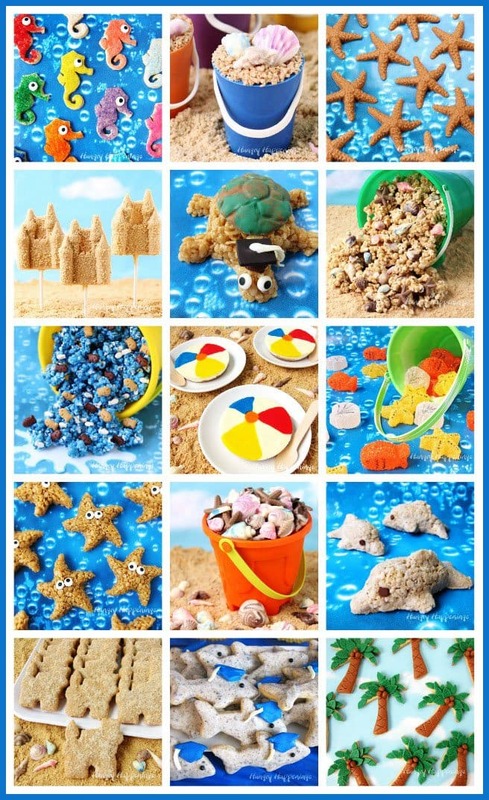 They are great for a beach themed party or any ocean themed party you have! Brush a thin line or two of the colored confectionery coating onto the sides of a disposable pastry bag. Fill bag with white confectionery coating. Pipe into sea shell candy molds. Freeze for 5-10 minutes until the candy hardens. 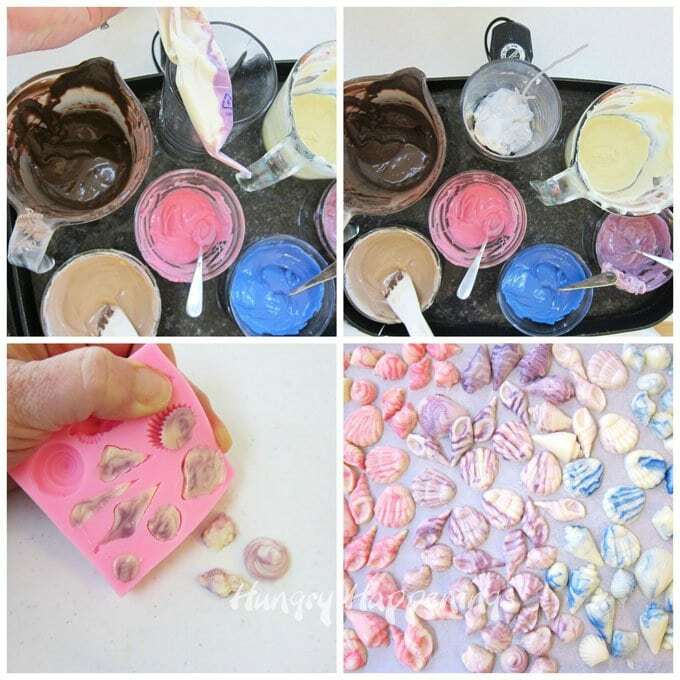 Remove and un-mold the candy shells. When you look at this picture, does it make you feel like you are at the beach? Ahh, I sure wish I was. In reality, I created this scene in my living room on my photography table. To create this photograph, I crushed up a box of cereal to make the sand, poured it all over my table, and attached a piece of blue sky paper to the wall then filled a small plastic beach pail with my chocolate sea shells, snuggled it into the cereal sand, and scattered more chocolate shells in the sand. 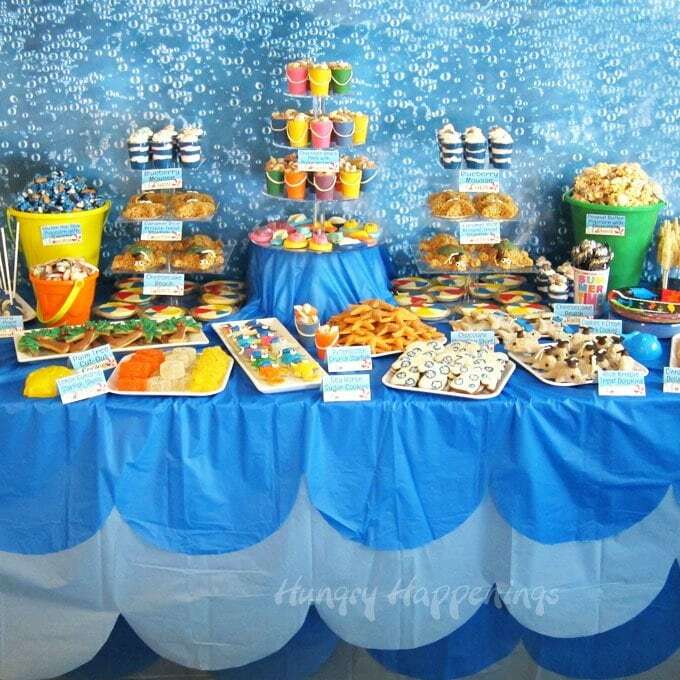 For the party, we created a wave pattern using several blue tablecloths and set all the beach themed treats on top. It wasn’t quite as realistic looking as the sand, but it was much neater for a party. 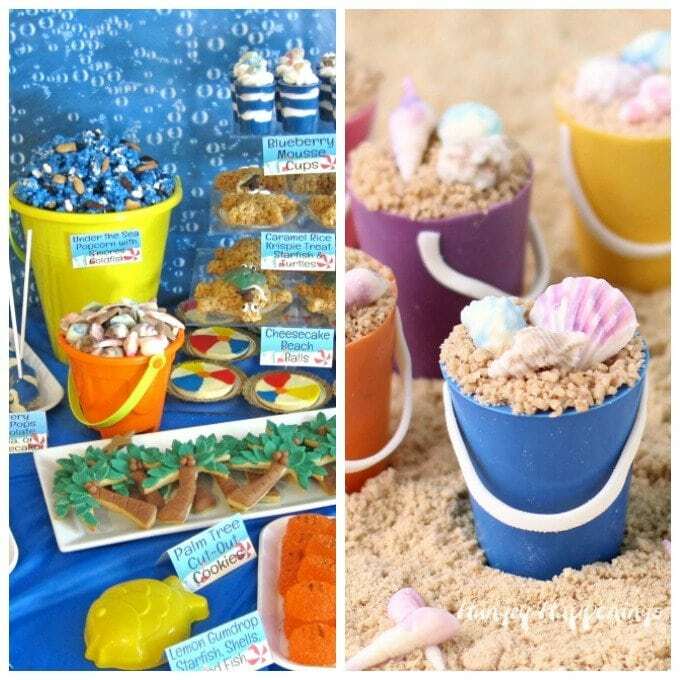 If you would like to know how to create any of the other beach themed treats that you see on this festive table, you’ll need to stop by regularly over the summer to see all the tutorials and recipes for the posts pictured below. I’ll share links as the posts go live. Thank you Christine. I’m glad you like them. Oh yes – striping the bag will be much easier than using a squeeze bottle. You save us all the trial and error. Thanks for mentioning the size of the shells. My chocolate molds are much bigger, but then hey – I don’t have to make as many 🙂 Just one shell per bucket. They look so realistic with the swirls. Tell us again, please, how you made the backdrop. It looks great. It seems you said you used bubble wrap. Did you spray paint it from the underside? I too have some large sea shell candy molds and they look really great, but were way too big for what I wanted on my dessert table. The backdrop in these picture were purchased at JoAnns. They come in a large roll, are made of paper, and are primarily used for classroom bulletin boards but also work great for backdrops in my photos. The sky and the bubbly water are both from the rolls. Once you make the chocolates, how long will they keep for. I’ve got a party next Saturday and I want to premake earlier in the week. Can I store in air tight container in fridge? You can make them up to 3 weeks ahead of time. Store them in an airtight container at room temperature. If you refrigerate them, condensation from the refrigerator will develop on the candies and they will become sticky. Have fun! Thank You…….Thank You…….Thank You !!!!! My cousin is having a beach theme wedding shower and I have been given the task of making the favors. I had no clue on how to make these and your post has saved me. I do have one question though…….Where did you find the silicone mold for the starfish ?? I have found a few in plastic but it makes me nervous because I have no clue how to get them out of the mold. What a wonderful wedding shower theme! I love it. The starfish mold I used was pretty old and it was plastic not silicone. I can’t find the exact mold but there are several others available on amazon, here – http://amzn.to/2krwsPM You can find the silicone molds I used to make the tiny shells from amazon here — http://amzn.to/2kpnWkh. That is an affiliate link so I earn a commission but it is how I bought my mold. It’s very small but it makes the cutest little shells. Have fun! Absolutely perfect ! I have learned so much for your website I just can’t thank you enough. I do have 2 more questions then I promise I won’t bug you again. 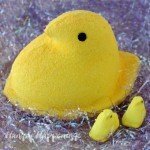 How far in advance can I make candy from molds? ( If I keep it sealed in a cool place is that ok ). If I want to brush on a edible shimmer dust, does that naturally stick to candy pieces or does it have to be brushed on when it’s still warm ? 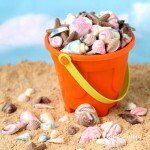 If you are making the sea shells from confectionery coating or white chocolate they will keep for at least a month. 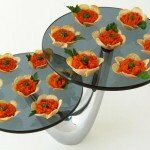 Store them in an airtight container in a cool place, not in the refrigerator. If you brush on shimmer dust it will stick on it’s own. Just pop the candy out of the molds, let it sit until it comes to room temperature, then brush on the dust. Have fun!!! You’re quite generous to share these imaginative and creative tips to the novice. 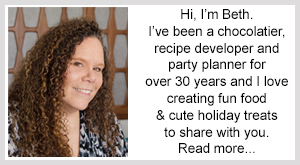 I look forward to receiving more recipes and ideas from you. That is so nice of you to say. I am so happy to share my knowledge and fun ideas with you. If you ever have any questions, please don’t hesitate to ask. Hi, you mentioned above confectionery coatings. What is the difference between confectionary coatings, white cholate, & chocolate melts. Thank you so much. Pure chocolate is made using cocoa butter while confectionery coating (Merckens, Wilton’s Candy Melts, Ghirardelli Melting Wafers, almond bark, Nestle Premier White Morsels) is made using vegetable oil, typically palm kernel oil. Pure chocolate requires tempering (a process of heating and cooling the chocolate so that you get a good snap and shine) while confectionery coating can simply be melted. You can see really detailed information on my Chocolate Making Tips page.